Controversial on-air personality, Daddy Freeze has criticized award-winning author, Chimamanda Ngozi Adichie, for saying she was “upset” that Hillary Clinton’s Twitter bio starts with “wife”. 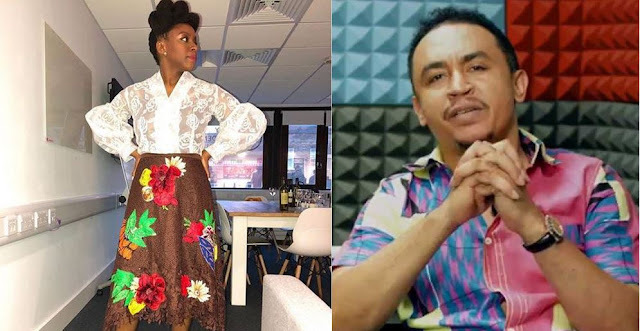 Daddy Freeze said he is torn between anger and respect as he was once a huge fan of Adichie’s literary work. “Dear Chimamanda, I used to be a huge fan until I read your interview with Hillary Clinton. “Now I’m somewhere in the vesica pisces, torn between the enormous respect I had for the quality of your work and anger for what you are beginning to brandish. “Let me set the record straight, I am not a fan of Hillary Clinton, so I’m not jumping in as her guardian angel. As a matter of fact, I completely disagree with most of the decisions she took while in office. “Besides this however, woman to woman, what Hillary has achieved, in my opinion, you NEVER CAN, ‘no be beans’, so you suggesting how she should be addressed is what we Yorubas call ‘Iwosi’. “Even Obama refers to himself as a dad first, husband second, so what’s your point exactly? Why can’t Hillary be addressed as wife first, if she so chooses? “Could your utterances be stemming from inadequacies you need to attend to? You might consider investigating this. “People have been over the last two years, urging me to preach about Jesus being black and I never have, do you know why? Because I DONT CARE ABOUT HIS COLOR, it’s irrelevant, I care about HIS MESSAGE! “In the same vein, I follow you simple because of your message, NOT BECAUSE OF YOUR GENDER OR COLOR OR TRIBE. So kindly keep the focus on the message, which in my opinion is excellent. Adichie sparked controversy after making the statement at the PEN World Voices Festival on Sunday.